Back in 2012, Procter & Gamble changed the packaging of Tide Pods to look less like candy in a jar after children showed an affinity for putting the colorful, shiny, toxic detergent packets in their mouths. While the move – and constant reminders to keep the detergent far, far away from kids – was meant to deter children from snacking on the poisonous packets, consumers are apparently finding a new use for the bright orange opaque container, a use that some say might not dissuade youngsters from thinking the contents are edible: Halloween candy buckets. While it might seem perfectly reasonable to “upcycle” the Pods packaging for another use after it’s served its intended purpose, some parents are concerned about the confusion that might result from the bevy of Pinterest projects depicting Tide Pod containers as festive candy-storage vessels. Consumerist reader L pointed us to Pinterest where, in anticipation of the upcoming spooky holiday, you can find several projects that turn Tide Pod containers into trick-or-treat candy baskets, among other things. As she points out, the Tide container’s curved shape and orange hue means these plastic jars can be quickly transformed into pumpkin-like containers that can be used to either store candy for hungry trick-or-treaters, or for kids to schlep around from house to house during their annual sugar harvest. For those who haven’t followed the saga of Tide Pods, shortly after Tide introduced the detergent pods in 2012 reports started surfacing that kids just can’t help but be enticed by the small orange, white and blue shiny blocks of detergent, licking, chewing and swallowing the packets. As a result, poisonings related to the products increased, federal safety regulators issued warnings and the company vowed to change the containers that hold the cleaning products. 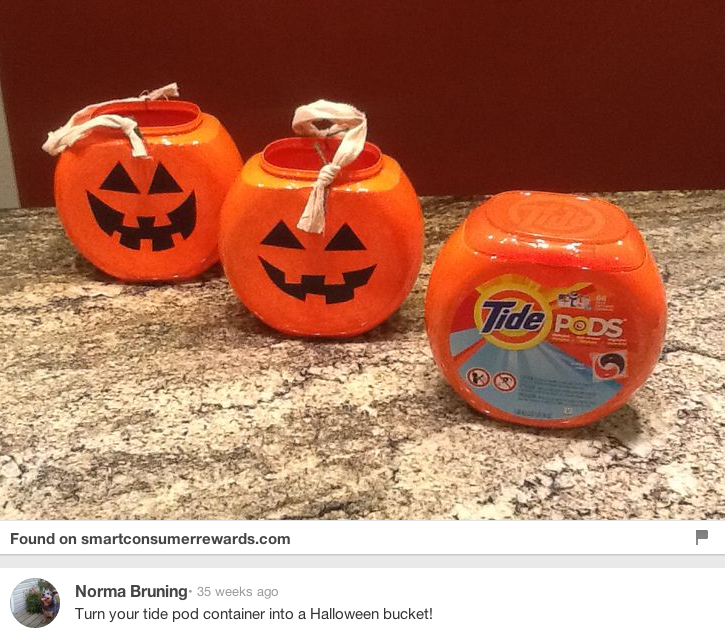 In spite of efforts by manufacturers to make the pods look less like candy jars, as of May 2015, detergent-related poisonings continue to grow. According to data from the American Association of Poison Control Centers, between 2012 and 2014 the number of reported poisonings jumped from 6,343 to 11,714. Which makes it all the more important to keep a separation between the containers that hold potentially lethal chemicals and those that should hold actual candy. 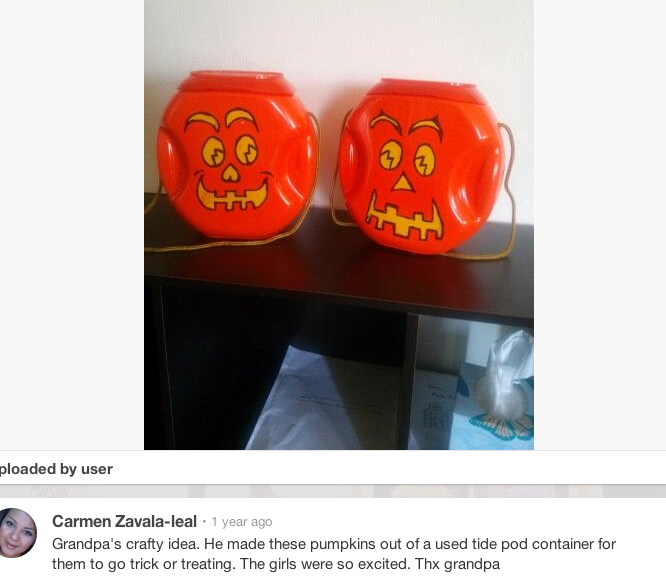 While potentially confusing a child on what holds candy and what holds detergent is bad enough, the reuse of Tide containers also created other concerns: are people properly cleaning these containers — which only recently held dozens of poisonous detergent pods — before turning them into treats totes? Another concern is that some parents may not have the patience to wait until their Tide Pods container is empty before upcycling. If so, are they putting the leftover pods in an equally safe opaque container or are they leaving them in a plastic bag on a low shelf in the laundry room? In a rush to make these cute crafts, parents may be inadvertently defeating the safety measure that the manufacturer has put in place. 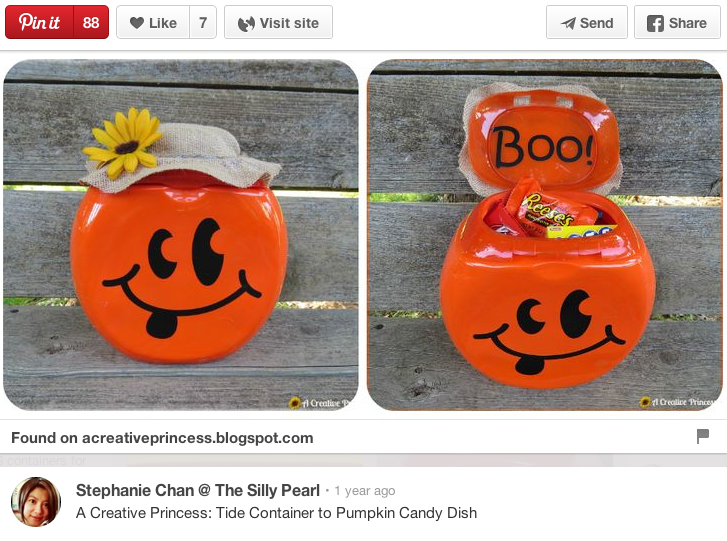 Of course, not all the Tide-container-turned-Halloween decoration projects on Pinterest were as worrisome. 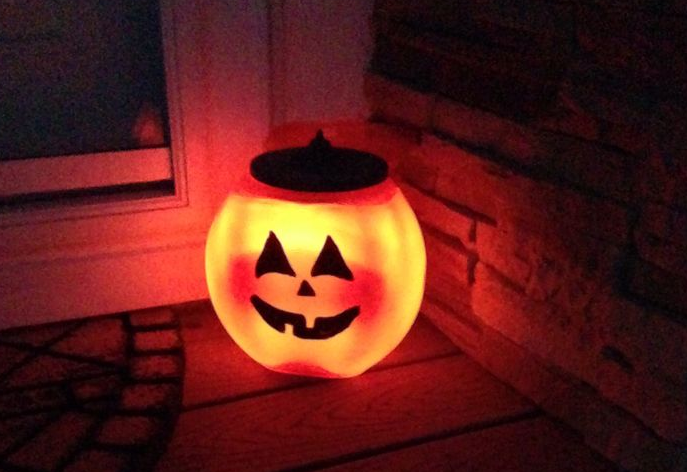 One resourceful upcycler used the empty packaging to create a jack-o-lantern – one that didn’t hold candy. Tide’s Answer To Slumping Sales? Use More Detergent Pods!